Theodore Roosevelt (1858-1919) was the twenty-sixth president of the United States. He was a leader of the Republican Party and founder of the short-lived Progressive ("Bull Moose") Party of 1912. Before becoming president in 1901, he held offices at the city, state, and federal levels. Roosevelt was the force behind the completion of the Panama Canal, sent the Great White Fleet on a world tour to demonstrate American power, and negotiated an end to the Russo-Japanese War, for which he won the Nobel Peace Prize. He was the first American to win the Nobel Prize in any field. 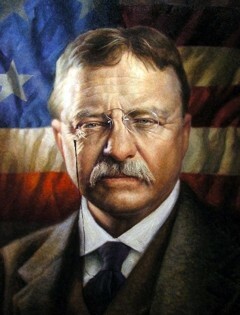 Roosevelt is also known for his achievements as a naturalist, explorer, hunter, soldier, and author. His published works include Rough Riders, The Strenuous Life, Hunting Trips of a Ranchman and Ranch Life and the Hunting Trail.